The staff we met were all very friendly. 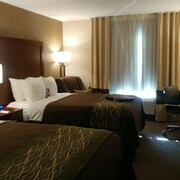 The suite was smaller than I expected, but nice. The breakfast was pretty good, and the evening reception was crowded but a great touch. I think the hotel is understaffed, however. Our room was never made up while we were there, and we ran out of towels and wastebasket space, and I saw that room service used plates sat in the hall for hours. The pool was quite nice, but a little cold, and the hot tub was out of service. Overall, good. Where to find South Portland hotels near an airport? Where can I find hotels in South Portland that are near tourist attractions? With ocean views, green spaces, and festivals, South Portland is the perfect Maine escape. Originally settled in 1630, the city of South Portland was created when a group of residents broke away from nearby Cape Elizabeth after an argument about drinking water rights. The area has housed a military fort and cargo ship construction operation over the years, but its main income stream today comes from the retail stores in Mill Creek. Get ready to shop and frolic on the beach! The fourth largest city in Maine, South Portland is an excellent vacation spot. With a thriving cultural scene, the area's only free beach, a summer concert series, and unique shopping, the city offers something for everyone. Explore the South Portland, Maine hotels, restaurants, and coastline during your stay. The average summer temperatures average around 22 degrees Celsius, while the winter temperatures in South Portland are well below freezing. Pack your sportswear so you can enjoy all of the outdoor activities here. The Greenbelt Walkway winds through South Portland and offers stunning views of the harbor. Your kids will love to play in Mill Creek Park and Hinckley Park, and you can head over to Willard Beach for a day at the seashore. 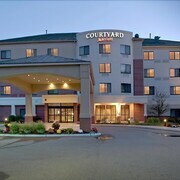 The hotels in South Portland, Maine will provide a comfortable place for you to rest near your favorite activities. With Expedia.ca, you can start your savings on rooms at South Portland hotels. Continue your savings when using the site to compare rates on a South Portland flight, find deals on a stay in top hotels in South Portland, and book discounts on cheap car rentals in South Portland. Get even deeper discounts when you bundle your car rentals, flights, and hotels in South Portland, ME together. With the Expedia Best Price Guarantee, you'll know that you're getting the most out of your vacation budget. What are the most popular South Portland hotels? 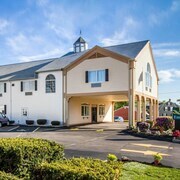 Are there hotels in other cities near South Portland? What other types of accommodations are available in South Portland? Explore South Portland with Expedia.ca’s Travel Guides to find the best flights, cars, holiday packages and more!